The White House has acknowledged for the first time that its intelligence reports on Iraq might have been wrong. Until recently, US President George W Bush had insisted that weapons of mass destruction would be discovered. But now his National Security Adviser, Condoleezza Rice, has given a round of interviews in which she acknowledges possible flaws in pre-war intelligence. The central argument used by the United States for invading Iraq was to rid Iraq of weapons of mass destruction. But more than nine months after Baghdad fell to US forces, no such weapons have been found. 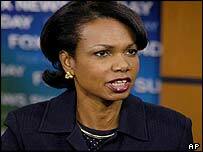 Ms Rice's comments follow calls from the former senior US weapons inspector, David Kay, for an independent inquiry. Mr Kay - who resigned last week - has said that in his view there were no significant stockpiles in Iraq before the war. The BBC's Justin Webb in Washington says this a painful process for the White House, but in the light of Mr Kay's testimony it is proving impossible for administration officials to stick convincingly to the line that banned weapons will still be found in Iraq. "I think that what we have is evidence that there are differences between what we knew going in and what we found on the ground," Ms Rice told CBS television. But she brushed aside calls for an independent inquiry into the intelligence in the run-up to the invasion of Iraq last March. Former Iraqi leader Saddam Hussein, she said, was a dangerous man in a dangerous part of the world and it had been time to do something about the threat he posed. "When you are dealing with secretive regimes that want to deceive, you're never going to be able to be positive," Ms Rice told NBC. "The US administration is beginning to hint that its intelligence may have been wrong"